First off, let me tell you about Air Asia. We were very happy to find out that we left 20 minutes ahead of schedule. Although I was a tad bit bummed that they didn't offer hot meals because it was just a short flight. 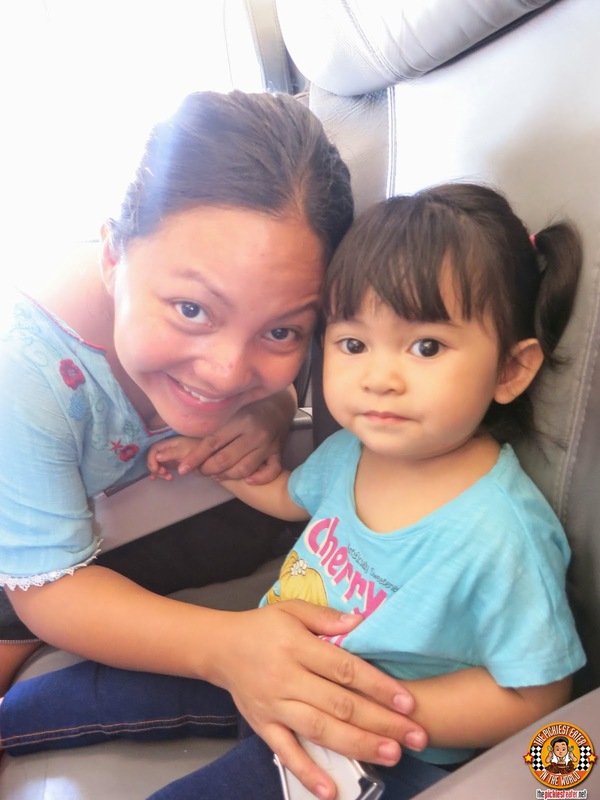 Baby Rain was very well behaved throughout the entire flight, which is more because the sound of the engine kinda freaked her out a little bit. 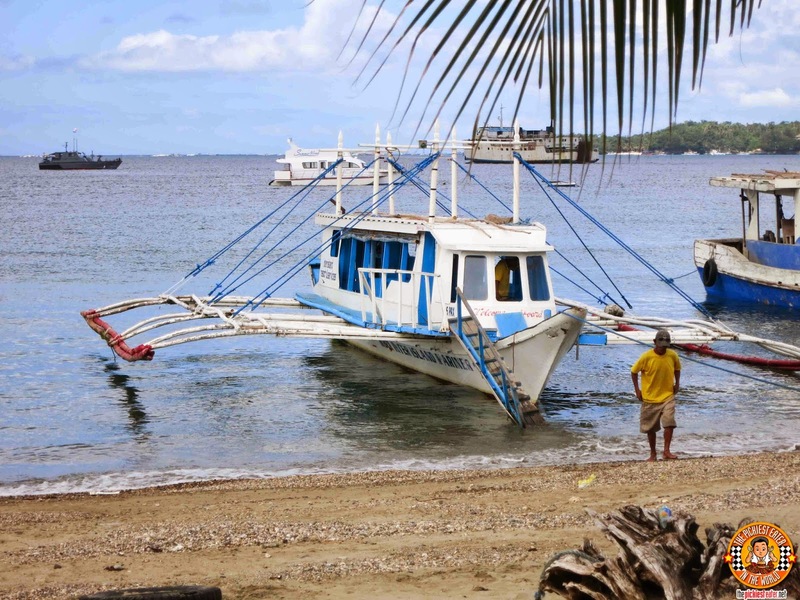 Unfortunately, Air Asia only offers flights to Kalibo, which is roughly around two hours away from the Caticlan Jetty, in which is used as the port to shuttle tourists to and fro Boracay. So what we decided to do was hired a private van to take us from Kalibo to Caticlan. Cost us an extra 2k, but considering we were with Rain, I think it was well worth it. 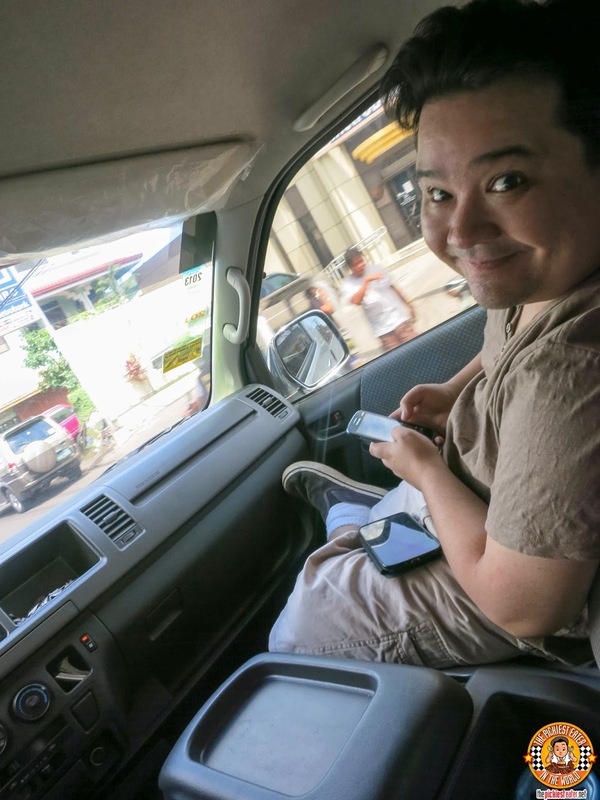 As we were en route to Boracay, I sent a text message to the number provided to me by The District's Manila office. On the other line, was Joefer, who guided our driver to the exact location of the awaiting boat that The District had prepared for us. 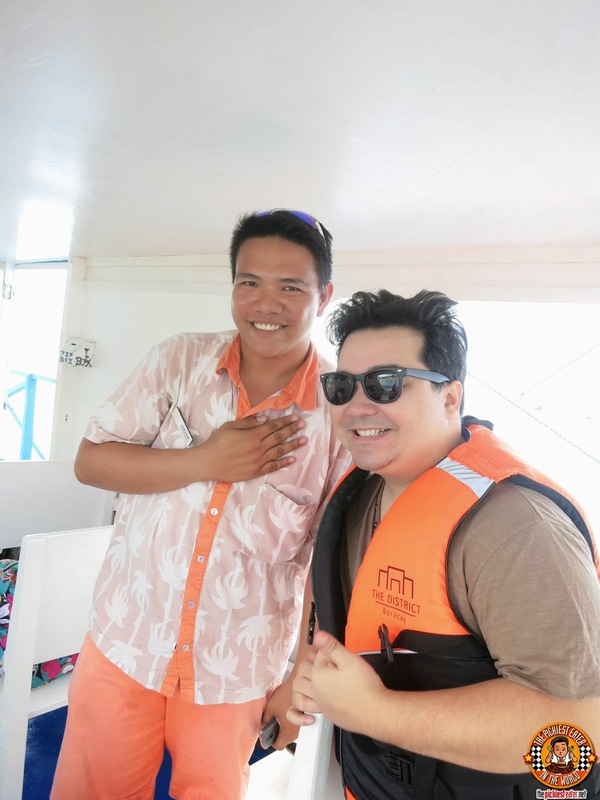 My new buddy Joefer made sure our life vests were all zipped up.. umm.. although I couldn't actually zip it up all the way (Apparently they don't make life vests in XXXXXL). 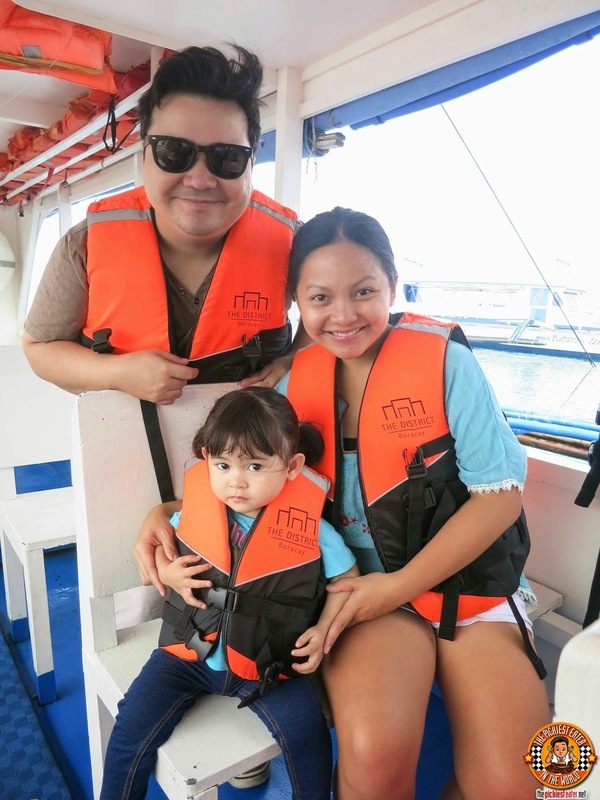 This was Baby Rain's first boat ride, and again, the scary noise from the boat's engine got her a little bit nervous. 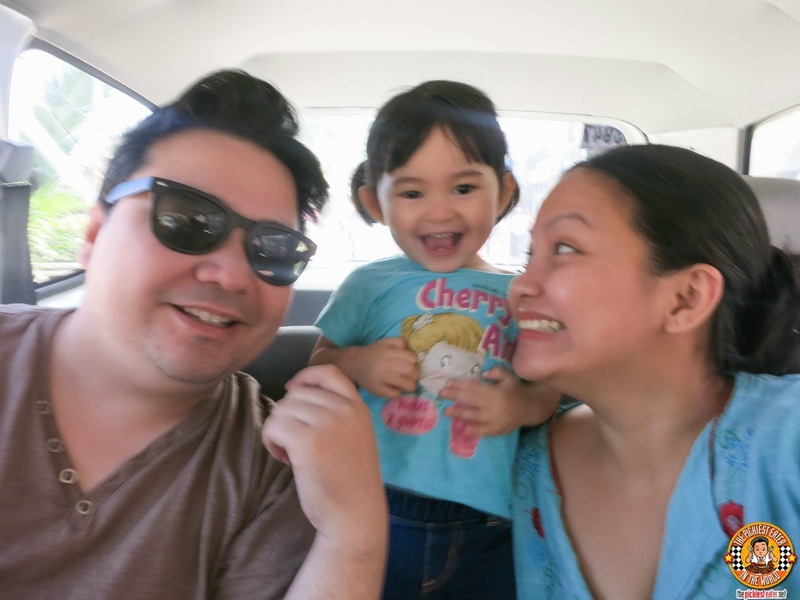 But of course when we got to the car that The District had provided for us upon our arrival, she went back to her kulit self! 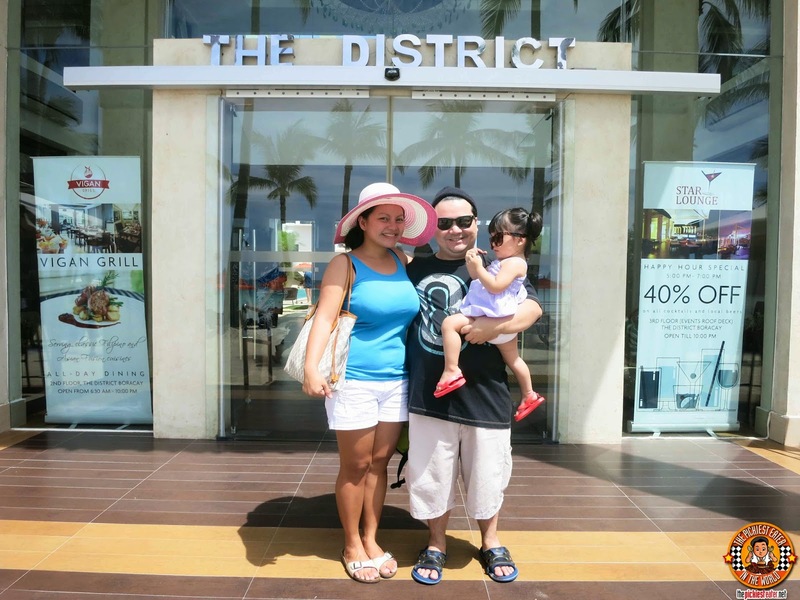 We were at The District Boracay. Though I was aware it is a boutique hotel, the larger than life images in my mind made The District seem a bit smaller than what I was expecting. However, at the same time, it was more luxurious as well. Upon our arrival, a whole bunch of members of the staff were lined up by the front desk to greet us. I had to look back to see if there was someone important behind me. It took me a second to realize that at The District, YOU are the most important person to them. There welcome drink was an intriguing lemon drink that offered a touch of spice at the back of your throat. 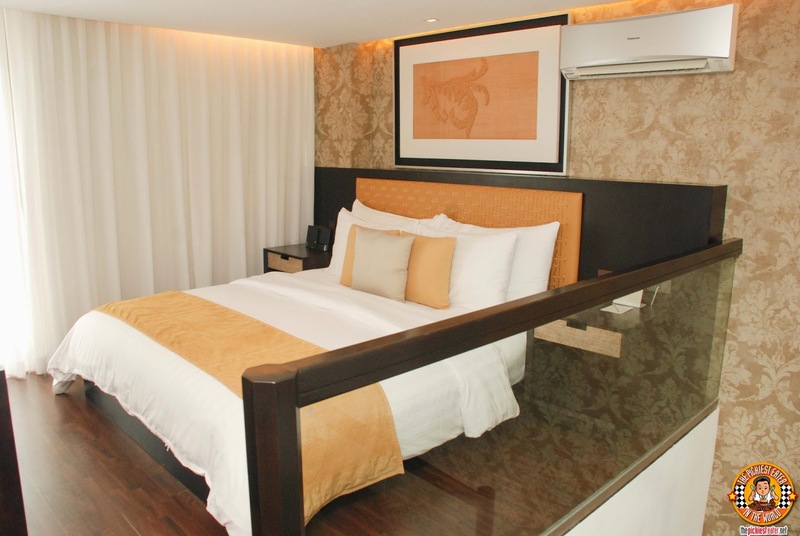 Though it clearly is a boutique hotel, the layout was planned out really well, making the most of its limited space, so that the area doesn't feel so cramped. The lovely April of The District led us to our room, which was conveniently located on the ground floor, directly in front of the pool. Which worked perfectly for me because it meant no climbing of the stairs required. 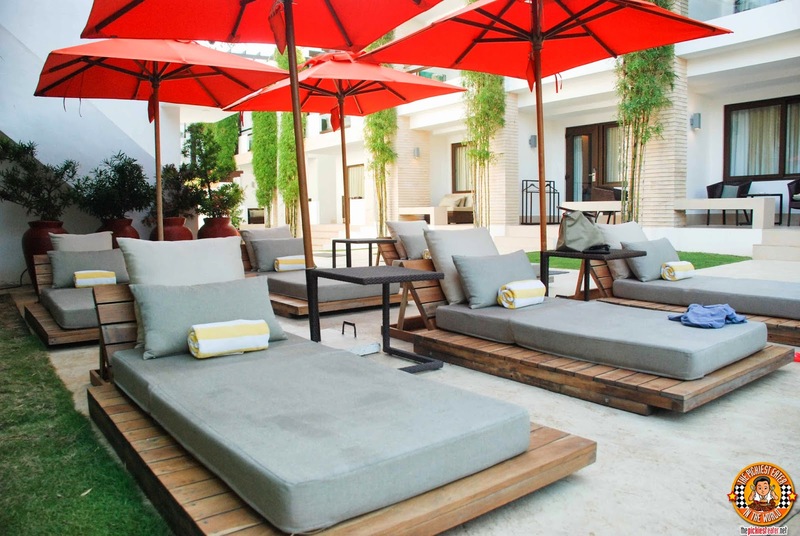 The entrance of our Deluxe room featured a small lanai, with comfortable lounge chairs for chilling out. If you are staying in the higher floors, you have a small balcony overlooking all the action on the ground floor swimming pool (And if you're lucky, some bikini babes hehe). 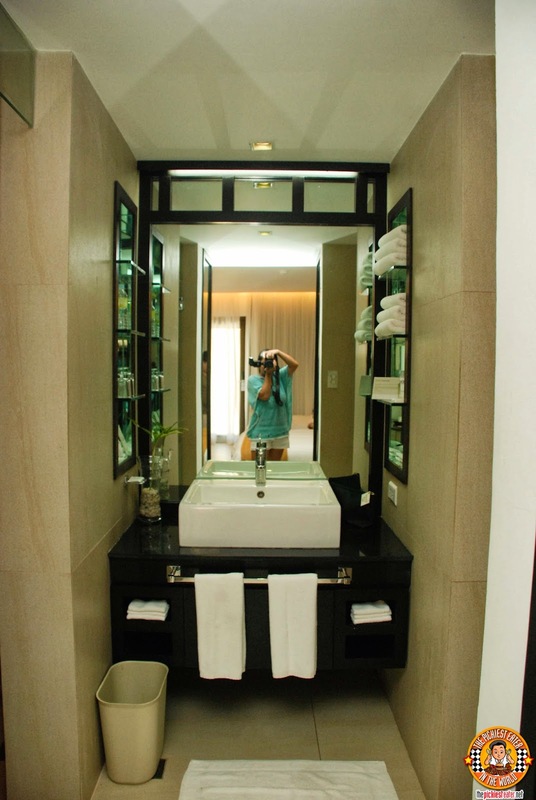 I've stayed at rooms in Boutique Hotels during trips to Singapore, Korea and Hong Kong, and compared to them, the Deluxe room of The District Boracay felt like a presidential suite, space-wise. The Deluxe Room is exquisite. It had two extremely comfortable double beds (meaning I had to sleep apart from my girls :(.. sniff ), with pillows and covers so soft, you would simply sink into after lying down. It's also worth mentioning that there are around four sockets available on the bedside table, which makes charging your phones or any other gadget, very convenient. 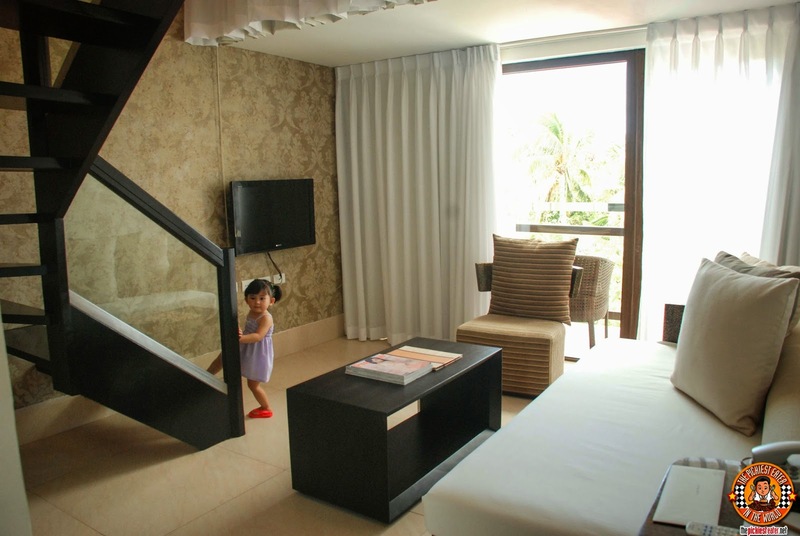 The room is also equipped with a flat screen TV, which doesn't sound like a big deal, considering you're not expected to spend a lot of time in Boracay watching Television, but when you're with a 2 year old girl that is a huge fan of "Hi-Five" it could be a lifesaver. 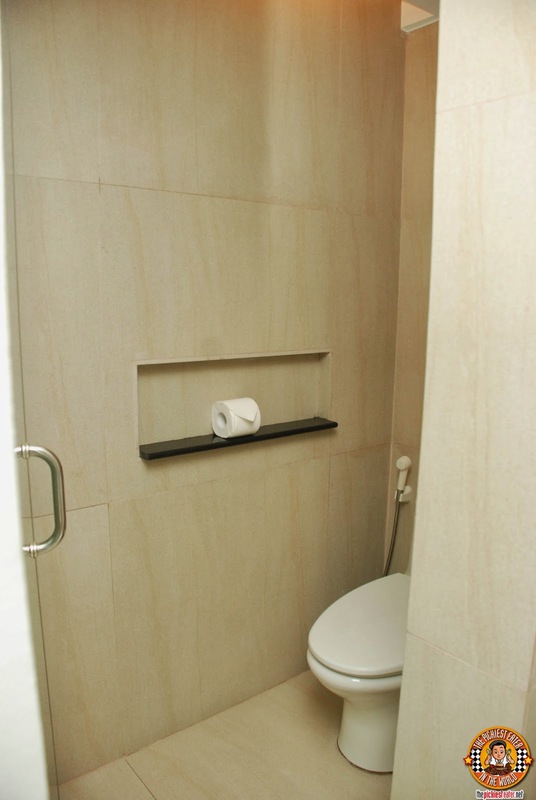 with the shower stall on the right, and the toilet on the left. 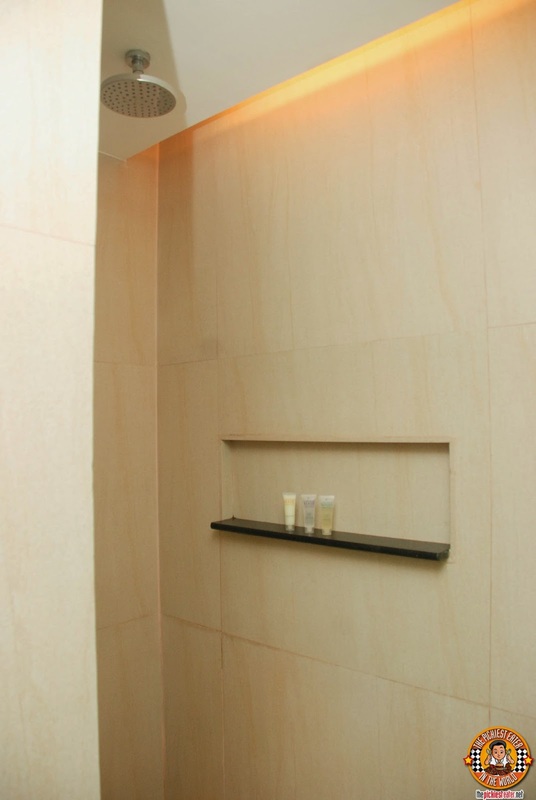 Spacious bathing area, Equipped with a Rainshower Head.. This is where I get most of my high scores in my mobile games. Rina said I have the bad habit of leaving my clothes on the floor when I get home. The geniuses of The District really get me. 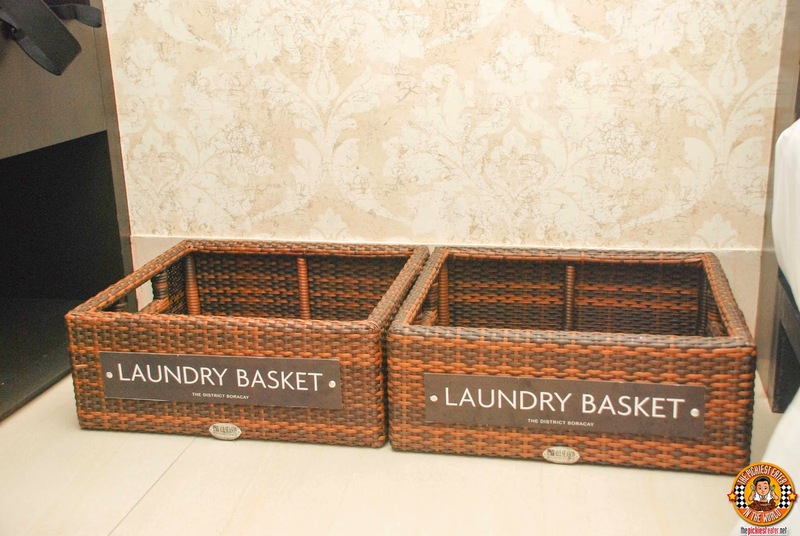 They made leaving your clothes on the floor acceptable, by strategically placing low rise laundry baskets on the side. 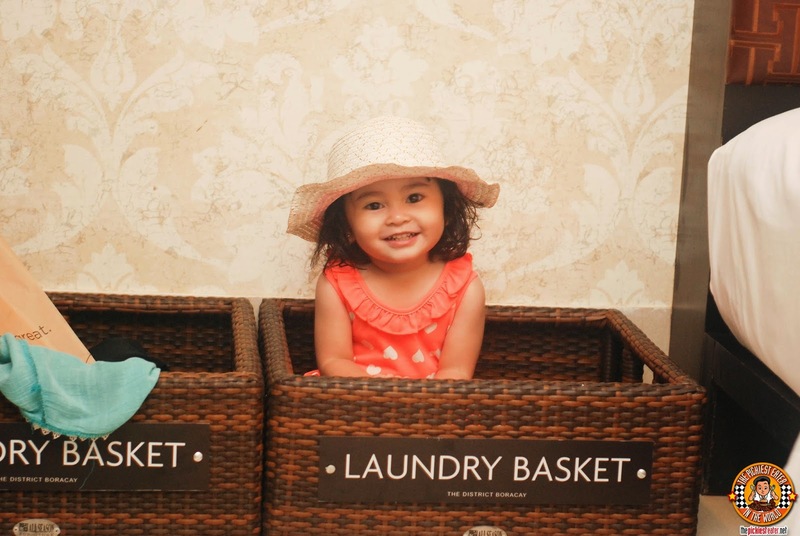 Other people saw a mere Laundry Basket. This little girl saw a playground. Thank you April for helping us settle in! Regardless of the time of day, the lap pool is a spectacular sight. My only comment was, it doesn't have a kiddie pool section. 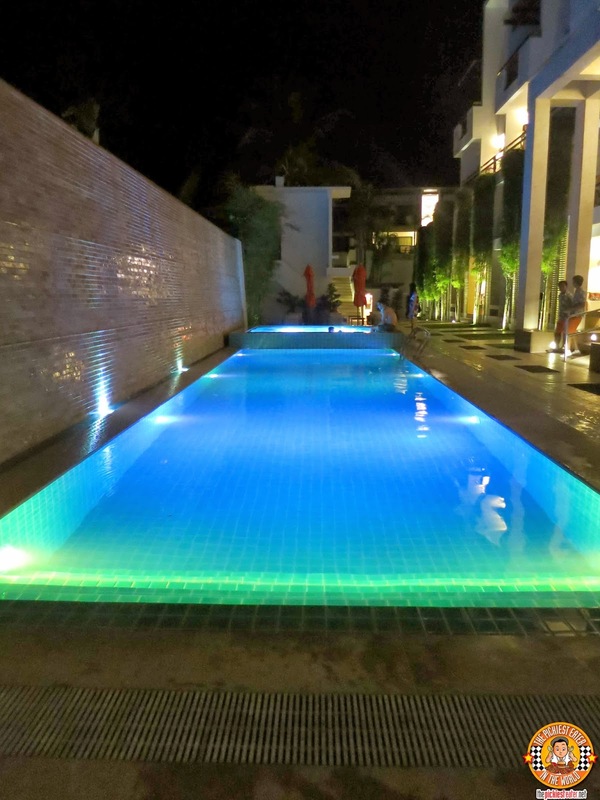 Instead, it has a Jacuzzi at the far end of the pool, which is popular with the younger crowd, as I noticed there were people swimming even late at night. 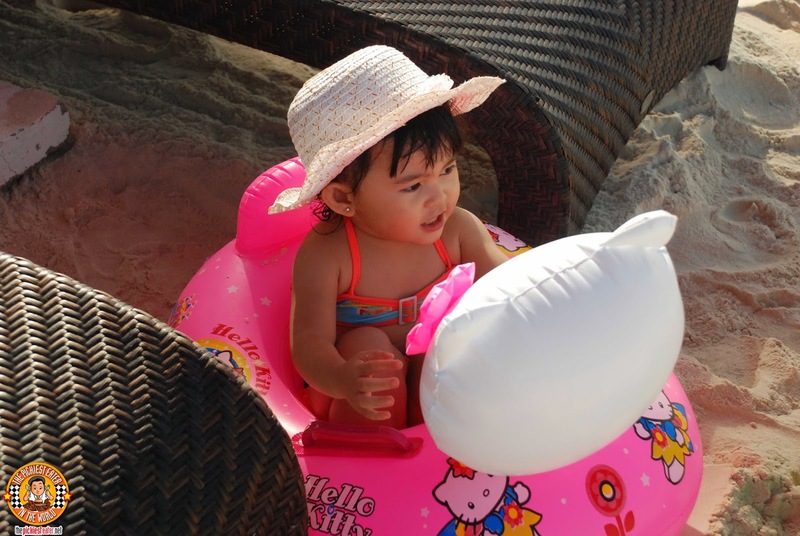 Rina and Rain had a wonderful time playing the Jacuzzi! had a wonderful time falling asleep on the lounge beds by the pool! 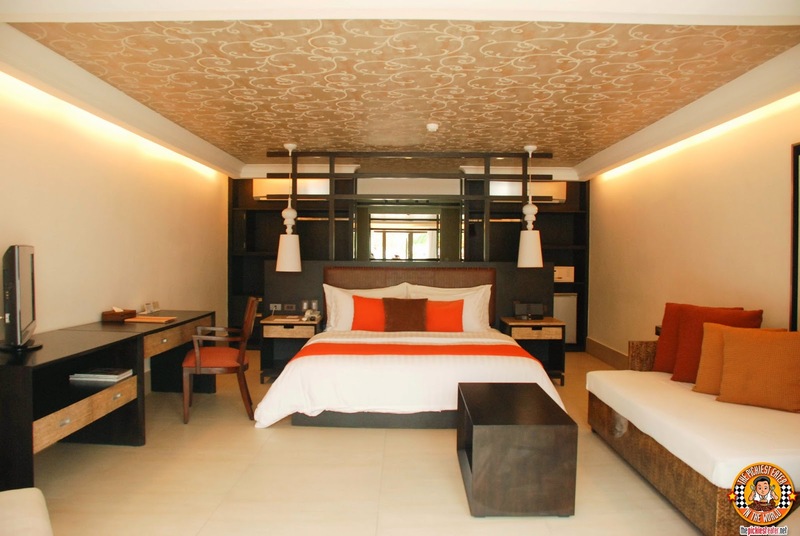 We were given the opportunity to see the other rooms that The District Boracay had to offer, and they were nothing short of amazing. For me, the best bang for the buck deal you could get would easily have to be the Premiere room. It's incredibly spacious, and includes a King sized bed, and a sofa that can double up as a sofa bed as well. Apart from that, the room also has the amenities of the Premiere room, but with an added luxury.. an iPod Dock! 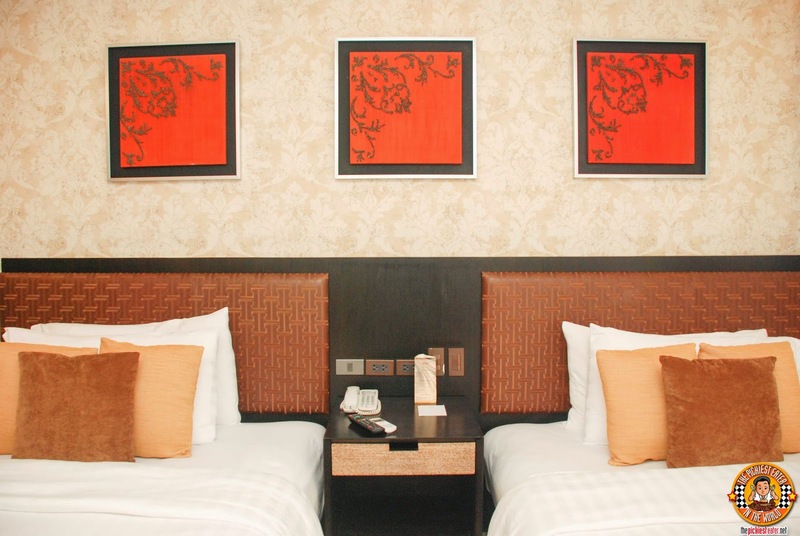 If you've got a little bit more money to spend on, you may opt for the Premiere suite. 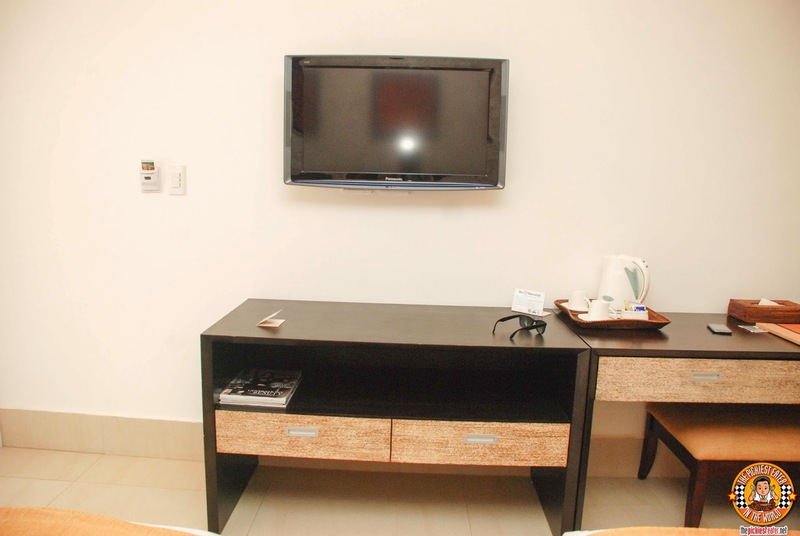 The suite is a two floor loft type room, that includes a cozy living room on the ground floor. With the bedroom perched up on the second floor. The King size is perfect for relaxing, and it also includes an iPod dock. 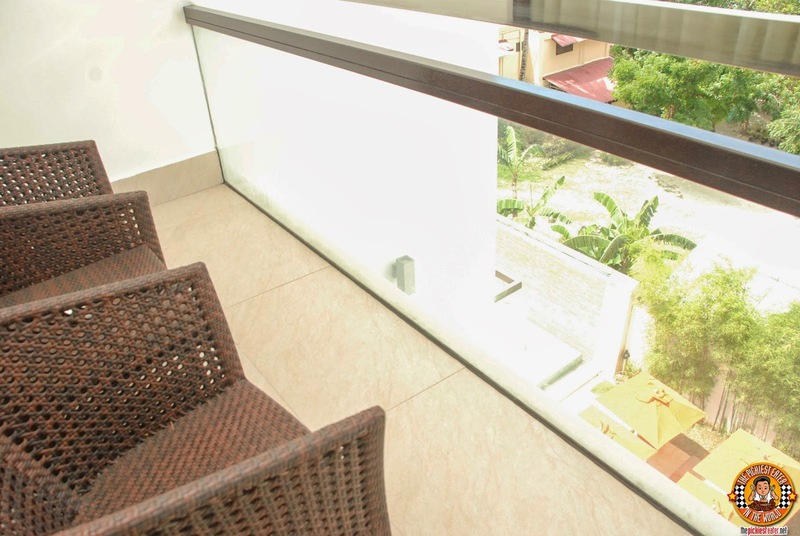 That also has a veranda that allows the refreshing breeze of the sea to captivate you. A special shoutout to Cindy for making time to take me, Rina and Baby Rain around The District! 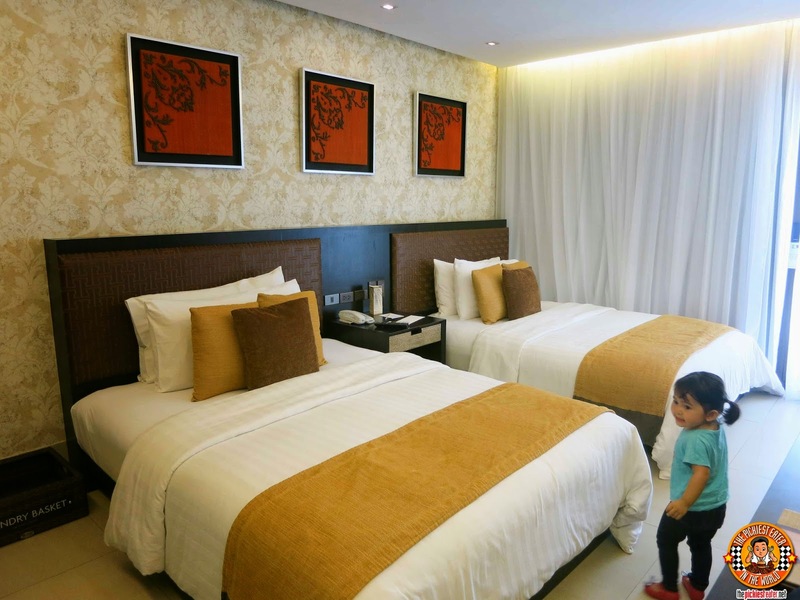 If the gorgeous rooms weren't enough to convince you that The District should be your default choice when talking about hotels to stay in Boracay, then let me tell you this: Among the hotels in Station 2, it has the best location. 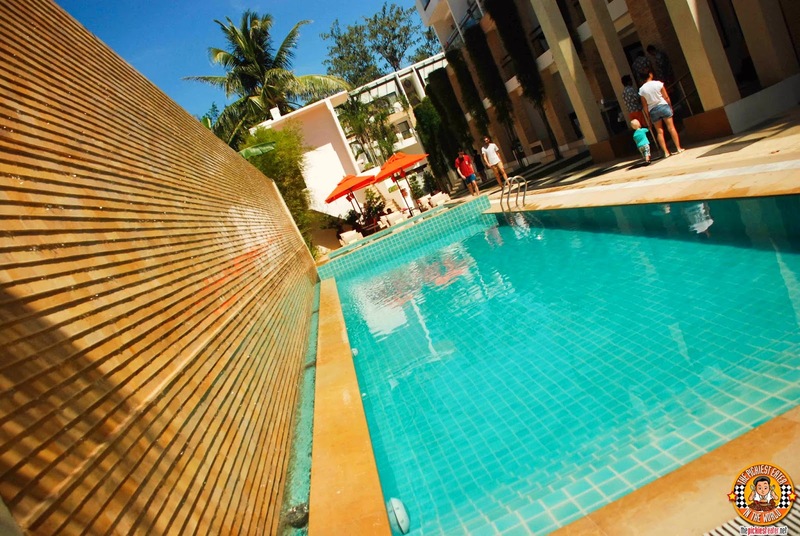 It's close to D'Mall, and its beach area is wide and always kept immaculately clean by the staff. As Baby Rain was playing in the sand, the District's beach attendant Myke dropped by with some beach toys for Rain! The next day, another attendant dropped by to lend Rain an inflatable Hello Kitty boat for her to use. Something that I must commend The District for, was their willingness to watch their guests belongings while they go for a dip. As I sat on my lounge chair, listening to my audio book, Myke approached me and asked me why I didn't go for a swim. I told him because I was worried about leaving our stuff behind while we were in the water. He assured me that he would make sure that our bags, phones and other belongings would be safe under his watch. 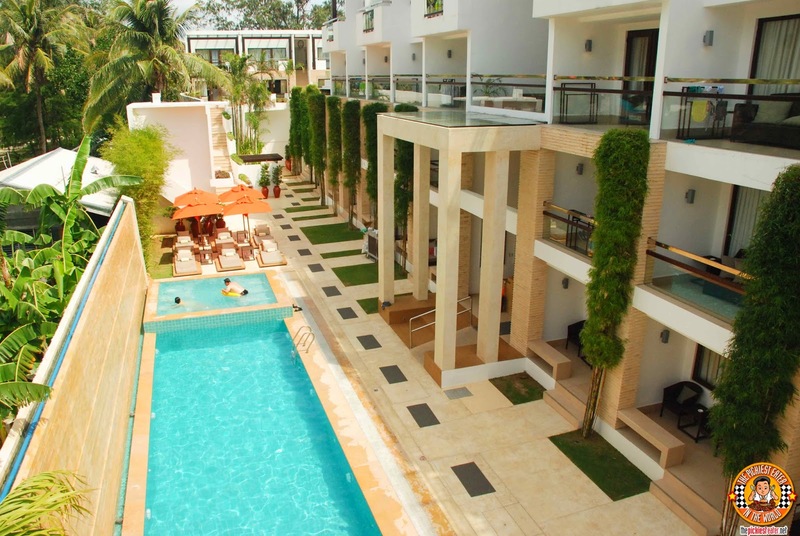 When we moved to another hotel, the following day, one of the first things I asked was that if our belongings would be safe in the beach area, in case I go for a swim. The receptionist actually had a prepared sign, clearly stating that the hotel is not liable for anything, and that guests were basically on their own. Rina and I looked at each other and said, "That's not how they do it at The District". 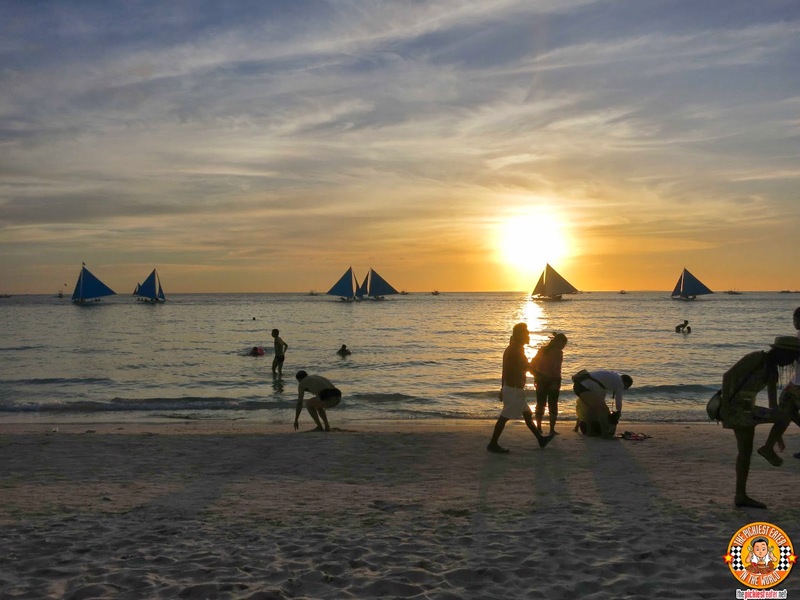 But the magic of Boracay truly lies in their spellbinding beaches. Every time I stepped out of The District, the sight of the beach never failed to take my breath away. 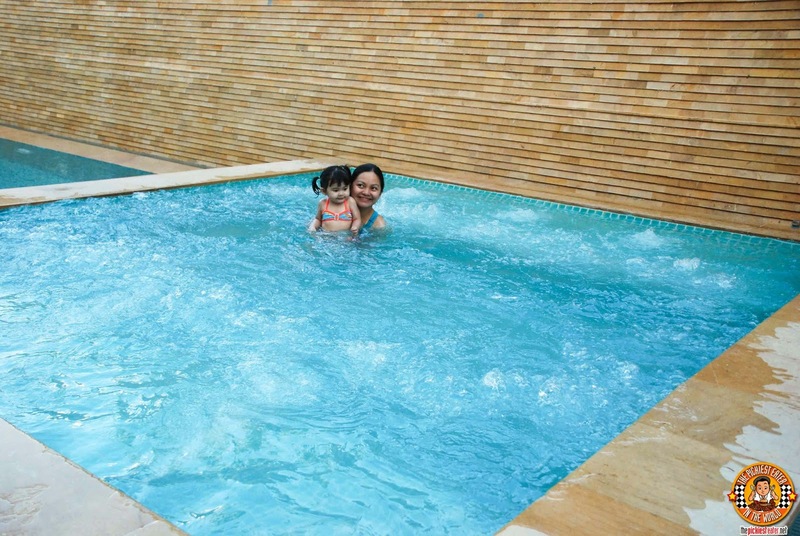 And the serene waters would seemingly command Baby Rain to come in for a dip, keeping Rina and I constantly on our our toes. 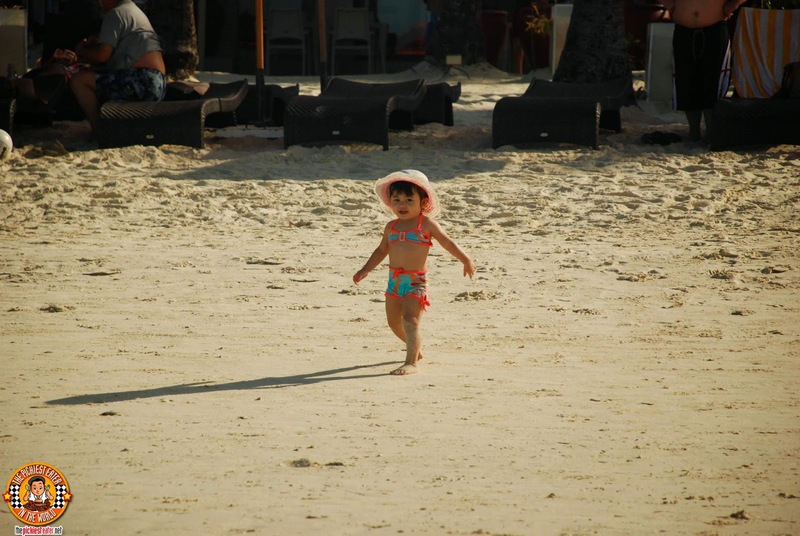 But my daughter had the time of her life, and was absolutely captivated by the lure of Boracay's sandy beaches. 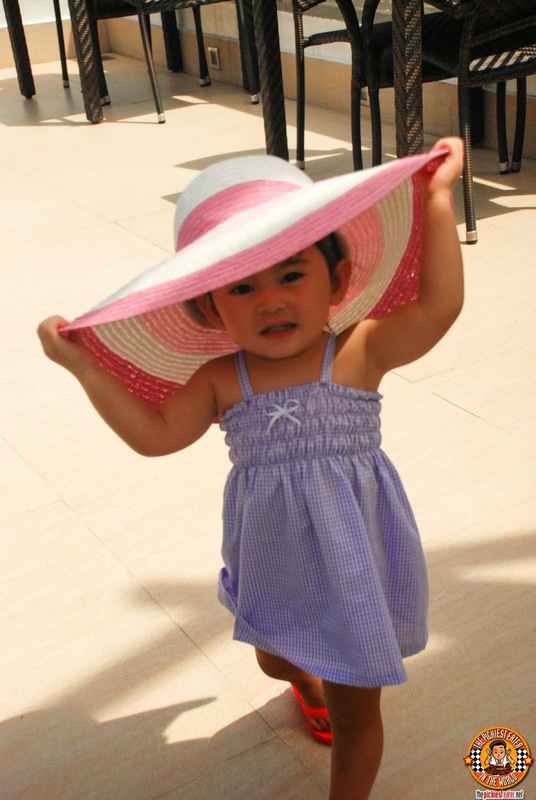 And perfect for me to show off my OOTD. Unfortunately, it was only after we got back to our room did my wife inform me that Rash Guards aren't supposed to be "tucked in", making me regret the missed opportunity to add the hashtag, "#Trendsetter". There are three places to dine at The District Boracay: Vigan Grill, Star Lounge, and Caruso, all of which I shall be featuring soon on the blog. 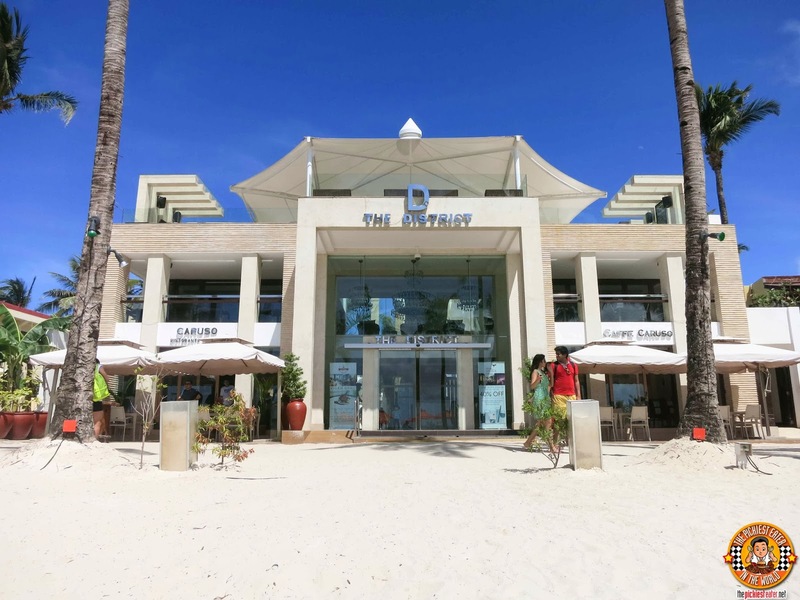 Star Lounge is located at the roof deck of The District, with comfortable lounge chairs and gives you a beautiful view of the sand and the sea. I seriously could just stay here for hours and watch the world go by. 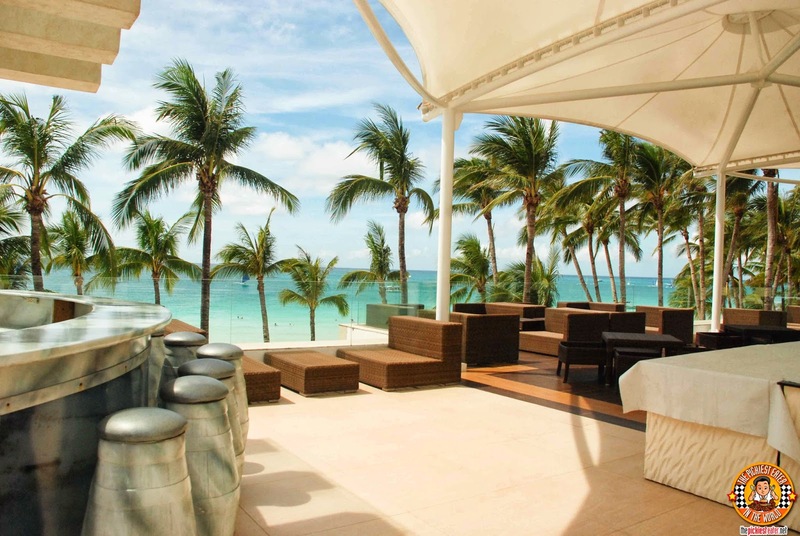 The District Boracay gives you the sophisticated ambiance of a luxury hotel, in a boutique hotel setting, right smack in the heart of the action in Boracay. 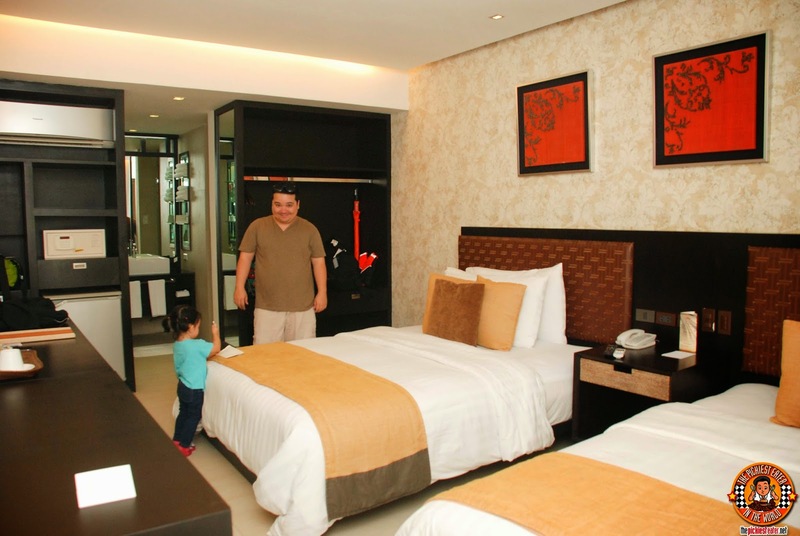 And though it will never be mistaken for a budget hotel, you definitely see what you're paying for. 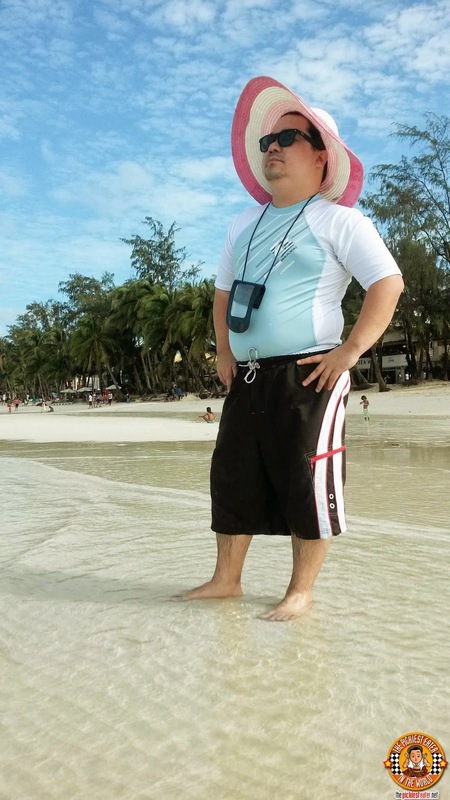 Don't be surprised if you see me at The District once again, during my next trip to Boracay. 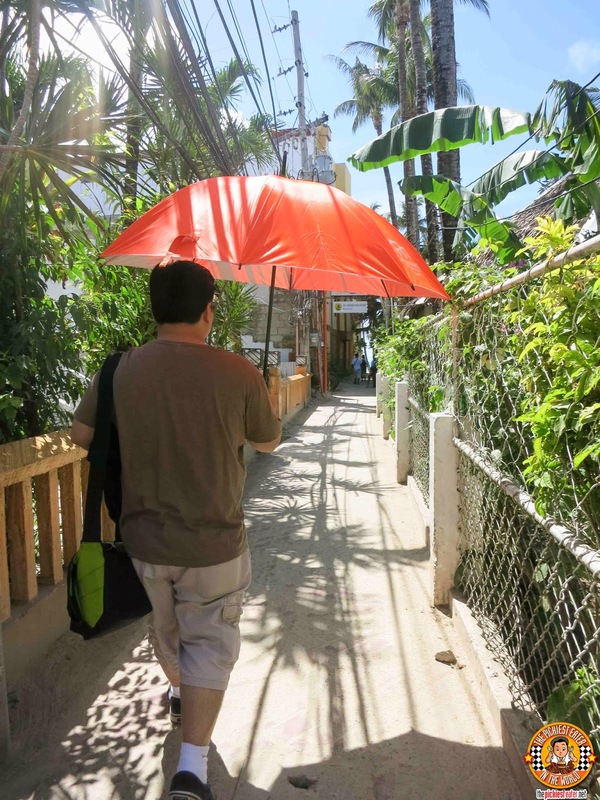 The District changed the way I viewed hotels in Boracay. I was a firm believer that the hotel you stay in when you visit the beautiful island paradise shouldn't really matter, because you'll be outdoors most of the time anyway. 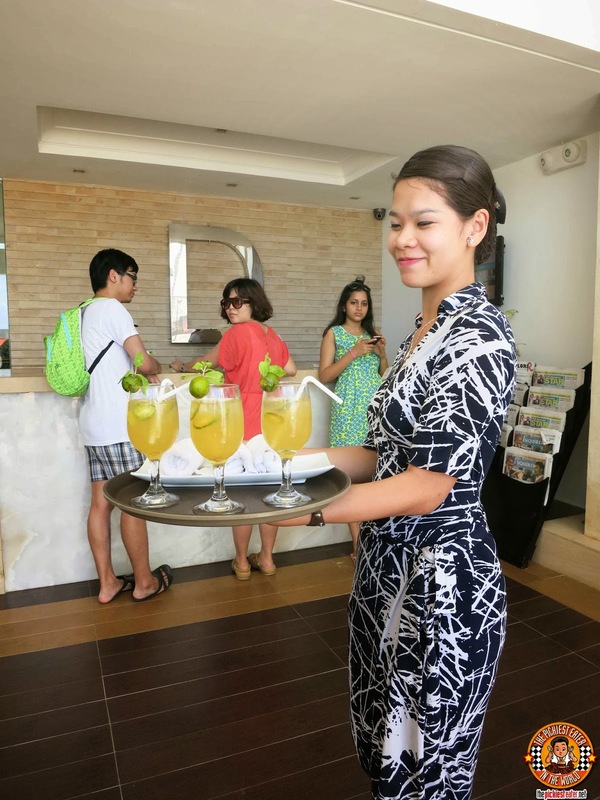 But after one night at The District, and getting a taste of their hospitality, service, and VIP treatment, I realized that you might as well go all in, and let your stay at their outstanding hotel become part of your memorable Boracay experience. 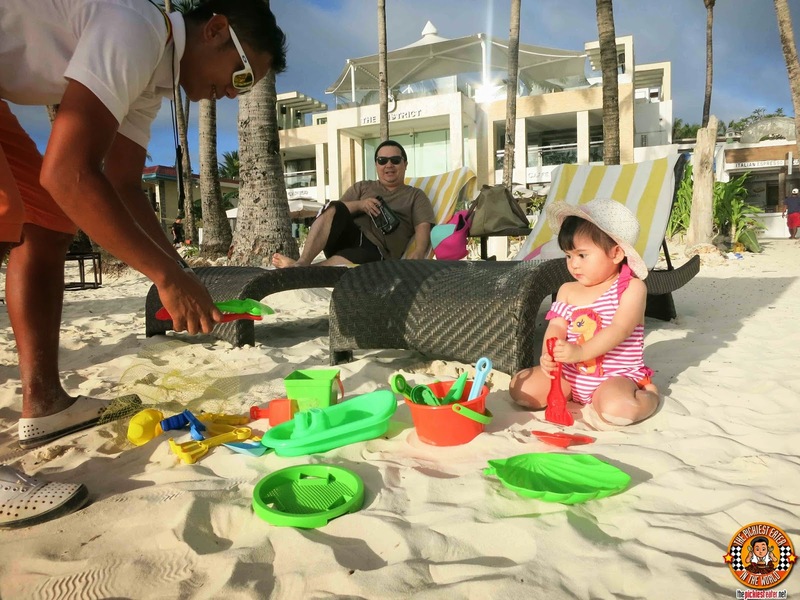 On behalf of Baby Rain, Rina and I, a heart felt thank you to Mae, Vina, Apple Chef Rey Dela Cruz, Cindy, April, Joefer, Myke, and Naomi, as well as the entire staff of The District, that made our stay in Boracay, one that will forever be ingrained in our hearts! 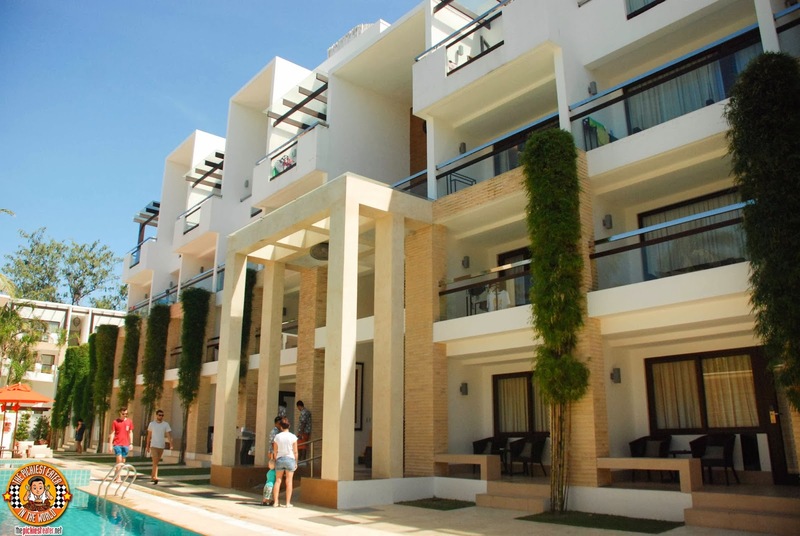 We will be back, The District Boracay! It is such a worth read.I was laugh out loud to the "throne" where you can get a high score. . Anyhoo..! The District is really one of a kind... 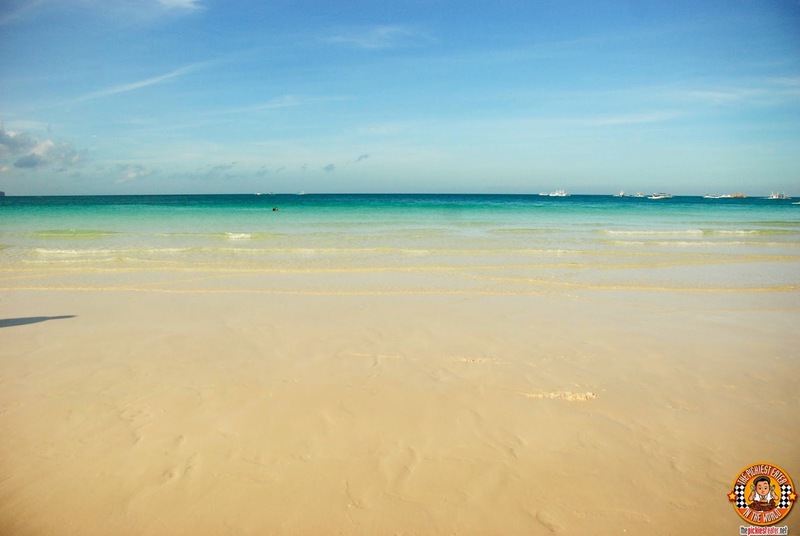 I wish I could go to Boracay someday.. hihihi..! It truly is one of a kind, Jocris! 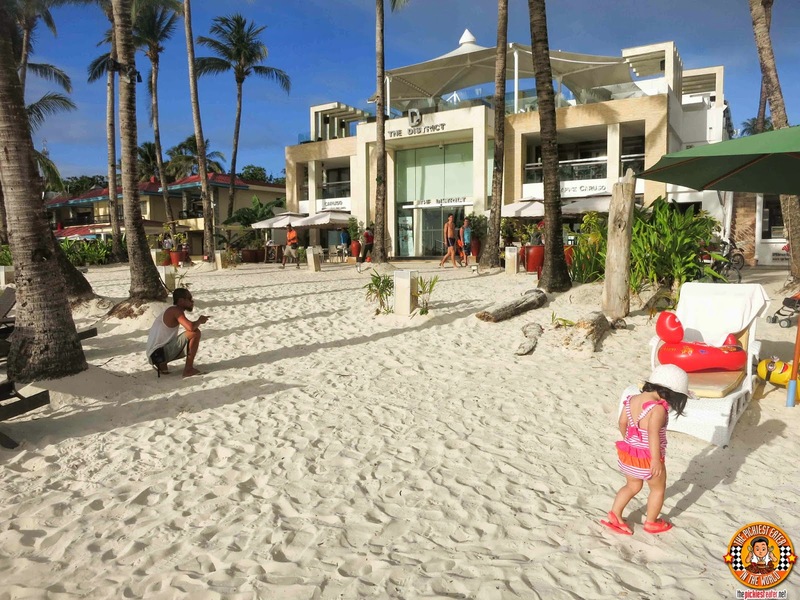 I highly recommend it on your visit to Boracay!